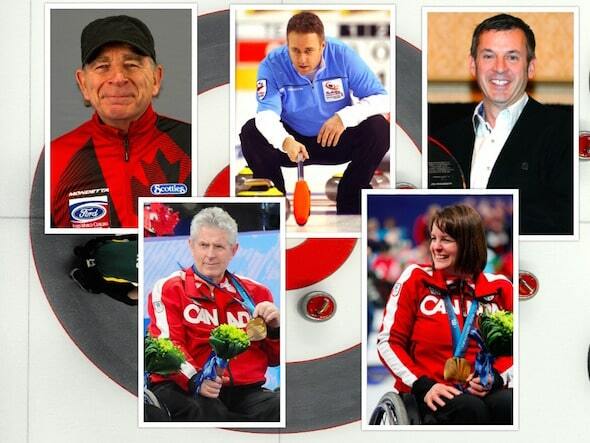 The five newest members of the Canadian Curling Hall of Fame include two Paralympic gold-medallists, a world-renowned coach, a respected journalist and a record-setting curler/builder. The five newest members of the Canadian Curling Hall of Fame, clockwise from top left, Earle Morris, Pierre Charette, Bob Weeks, Ina Forrest and Darryl Neighbour. Ina Forrest, Darryl Neighbour, Earle Morris, Bob Weeks and Pierre Charette will be formally inducted into the Canadian Curling Hall of Fame at the Hall of Fame banquet during Tim Hortons Brier week in Ottawa. Also during Tim Hortons Brier week, the winner of the 2014-15 Curling Canada Volunteer of the Year award will be honoured: Louis Tanguay of the Winkler Curling Club in Manitoba. Here’s a closer look at the five newest Canadian Curling Hall of Fame members and the 2014-15 Curling Canada Volunteer of the Year. Pierre Charette of Gatineau, Que., is one of the most accomplished players in Quebec curling history, and has devoted countless hours to building the sport, not only in his home province but across the country. As a player, he is a seven-time Quebec champion — 1989, 1993, 1996, 1997, 1998, 1999 and 2007 — and won-back-to-back silver medals at the Brier, in ’98 and ’99 playing vice-skip for Guy Hemmings. Charette is the only player to play at the Brier in all four positions, and was the first-team all-star third in 1999 and the second-team all-star third in 1998. In addition to his Quebec men’s championships, he won three Quebec mixed championships (in 1991 and 1992 as a skip; in 1986 as a second, and also skipped two provincial senior men’s championship teams (2010 and 2012). Off the ice, he has played an integral role in the development of the Grand Slam series of events. He is a former president of the World Curling Players Association, and now manages the Grand Slam events from coast to coast. A native of Spallumcheen, B.C., Forrest is one of the world’s most decorated wheelchair curlers. Since taking up wheelchair curling in 2004, Forrest has won three World Wheelchair Curling Championship gold medals and two Winter Paralympics Games gold medals, and been a valued member of Team Canada since 2007. Forrest will be attending her eighth consecutive World Wheelchair Championship, beginning Feb. 21 in Lucerne, Switzerland. She was an alternate for Team Canada in 2007, and has been in the lineup ever since, winning world gold medals in 2009, 2011 and 2013. Additionally, she helped Canada claim Paralympic gold in 2010 at Vancouver and 2014 at Sochi, Russia. Earle Morris has devoted his adult life to sport of curling, impacting the game in a number of different areas of play, coaching and national performance programming. His curling career was highlighted by his history-making achievement as the first man to represent three different provinces at the Brier: Manitoba in 1980, Quebec in 1982 and Ontario in 1985, a feat now matched by his son and Ryan Fry. Morris’s remarkable coaching career includes mentoring Canadian champions John Morris (juniors in 1998), Rachel Homan (juniors in 2010, Scotties Tournament of Hearts in 2013 and 2014) and Pat Simmons (2015 Brier). Those teams won one world championship, two world silver medals and two world bronze medals. Morris spends much of his time working with adults and youth at the recreation level, including being a major influence on Curling Canada’s Adult Learn To Curl programme, which is changing the look and feel of curling clubs across the country. His concept to replace the traditional one-day fall course with this new programme, and the creation of a curriculum to train the trainers in Canadian curling centres, has been a game changer for curling. Additionally, Earle was the General Manager of the Canadian Curling Association from 1987 to 1989. Darryl Neighbour of Richmond, B.C., proved last spring that age is no barrier in the pursuit of athletic excellence. At the age of 66 (he turned 67 last July), Neighbour added to what had already been a brilliant career by winning his third Canadian Wheelchair Curling Championship. He was the vice-skip for Team B.C., skipped by Gerry Austgarden. That title, combined with his stellar success on the world stage with Team Canada, earned him the call from Curling Canada to join the Canadian Curling Hall of Fame. Neighbour and Forrest were teammates on the 2010 Paralympic gold-medal team, as well as on the 2009 and 2011 world championship Canadian teams. Neighbour also represented Canada proudly at the 2008 and 2012 World Wheelchair Curling Championships. Bob Weeks has spent most of his journalism career chronicling the sport of curling, and is one of the most respected and wide-read curling journalists on the planet. In addition to his newspaper and television work, Weeks has authored four books about curling — The Brier: A History of Canada’s Most Celebrated Curling Championship; Curling For Dummies; Hurry Hard: The Russ Howard Story (co-authored with Russ Howard); and Curling, Etcetera. He spent more than 25 years as the curling columnist for the Globe and Mail, and also was editor of the Ontario Curling Report for 30 years. Weeks, a Toronto native, currently is working as a curling reporter/analyst for TSN. A three-time winner of the Scotty Harper Award for curling journalism, Weeks was made an Honourary Life Member of the Ontario Curling Association in 2009. Louis Tanguay worked tirelessly on behalf of his hometown, and his hometown curling centre, during the 2014-15 season to make the 2015 Manitoba Scotties provincial women’s championship in Winkler, Man., an off-the-charts success. As the event’s co-chair, the longtime community booster helped oversee an event that produce a profit in excess of $100,000 and generated sellout crowds. 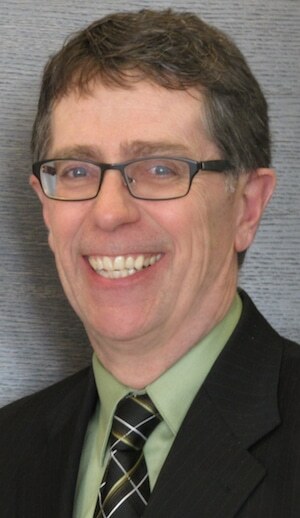 His hard work earned him both the Curl Manitoba Volunteer of the Year award as well as the Winkler and Area Community Foundation Citizen of the Year award. In addition to being an avid curler himself, he has served the Winkler Curling Club as president, past-president and secretary, in addition to volunteering his time in ice preparation, year-end clean-up, fundraising and bartending.